Always honored to share pages with poets in my community. 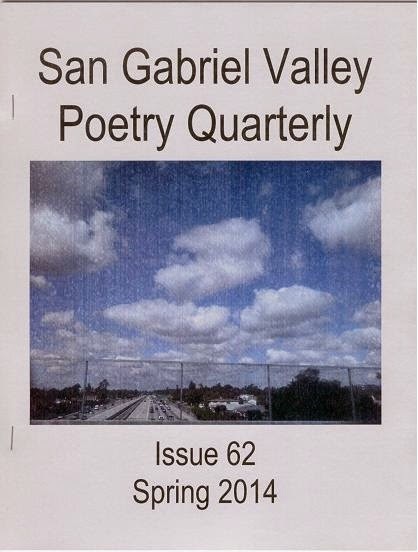 I am very excited to have my poem, “Reef of Clouds” be included in San Gabriel Valley Poertry Quarterly, Issue 62 Spring 2014, with 38 other poets, including Raquel Reyes-Lopez, Marie Lecrivain, and Don Kingfisher Campbell. I will get to read with these lovely people on Saturday, May 31st between 3-5 pm, at the Santa Catalina Branch of the Pasadena Public Library on 999 E. Washington Blvd.